A few days ago, while talking to a client, I found myself agreeing to a vague deliverable called a marketing campaign. As the leader of a marketing division, a marketing campaign should be right in my wheelhouse. As I talked over my meeting notes with my team, I quickly realized that I had absolutely no idea what I had agreed to. To make things worse, I had agreed to do this nebulous activity at least once a month for the client. Like a true millennial, I decided to Google it. 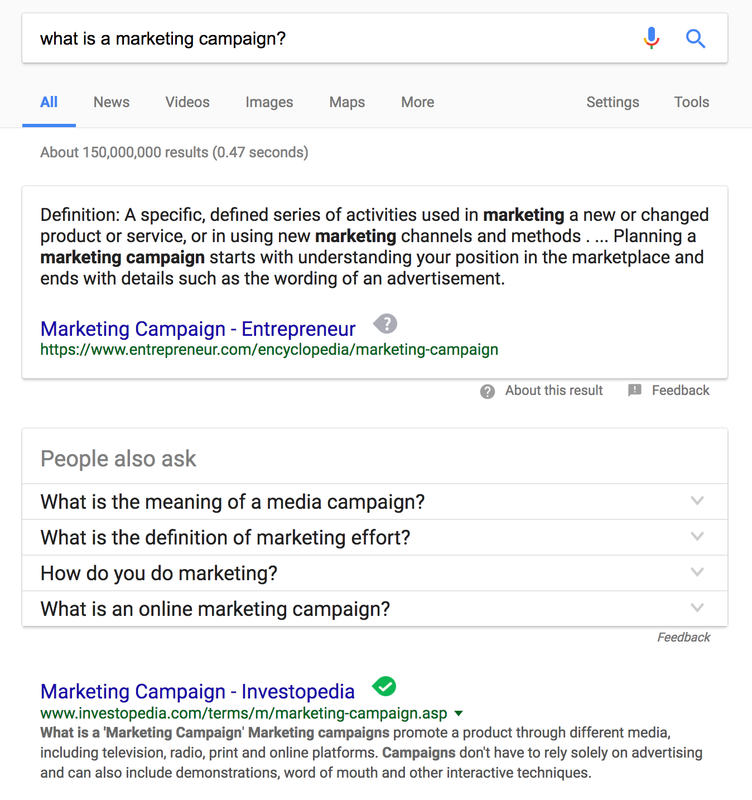 After a few more search queries, it became clear that no one who’s able to rank on SERPs really knows what a marketing campaign is. The definitions range from daily posting on social media to making a company-wide marketing calendar. My frustration with the lack of on-demand knowledge quickly turned to introspection. After all, I’m a marketer. I should know this stuff. But since I didn’t, I decided to account for what I did know. Marketing’s goal is to drive new revenue through highly-targeted communication. What I don’t understand is the campaign part. Some sources refer to campaigns as promotions or deals, others as updated messaging or branding, and most of them focus on the use of new media channels. So I headed back to Google. 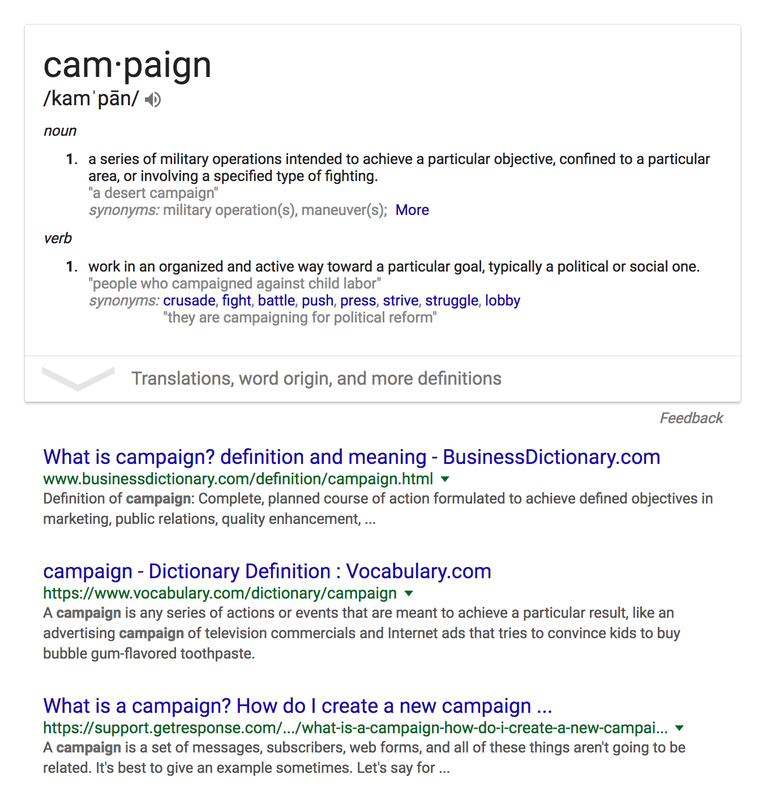 By the definitions above, my team runs campaigns — organized, well-planned courses of action formulated to achieve a particular result — every day. If we didn’t, our clients would fire us and we would have never achieved the results we have. This still hasn’t clarified what a marketing campaign is and how it differs from a marketing strategy. Why Is the Topic So Vague? One of the things I’ve discovered about corporate life, specifically with a focus on marketing, is that the skills that differentiate great marketing executives form the average joes are never found online. I don’t fully know why, but I do know is that the skills that help me achieve great results for my clients have come from my mentors, and when I Google these topics and strategies, they don’t appear in search results. I believe this is because so many marketers are marketing themselves and their generic strategies. I’ll save that topic for another day. A marketing campaign is an activity that takes place outside of the day-to-day marketing tasks that are specifically designed to boost new revenue and enhance customer interaction. It can be a massive organized effort with millions of dollars backing it, or it can be so simple that only a few individuals even recognize it. At the end of the day, its success comes down to the extent that it was able to attain new revenue and interaction with the brand.
. Planning: This is where you identify the goal and set firm target metrics for your campaign.
. Coordinating: Successful campaigns require the involvement of multiple marketing disciplines that play highly specific roles.
. Execution: Great campaigns take flawless execution from the entire team. Planning — When planning your campaign, it’s important to remember multiple factors. First and most important, is your target. This will be based on new revenue metrics. For example, let’s say you want to add an additional $100,000 to your bottom line next quarter. Second, you have to look at the cost of the campaign. Spending $110,000 on a campaign to gain only $100,000 doesn’t make sense. Coordinating — Great campaigns are made of hundreds of little tasks done well. It requires leveraging designers, copy writers, paid ad specialists, SEO experts, developers, PR specialists, and your sales team, to name a few. Not every campaign will use the same talent, but missing one of these key roles will negatively affect the campaign’s performance. Execution — This is where the rubber meets the road. I’ve been a part of many marketing campaigns and without a doubt, the most difficult thing to get right is the execution. This is because most campaigns feature a ton of moving parts. Getting all of these parts moving in the right direction is extremely difficult. At Mindbox, we force ourselves to put actions and firm deliverables around the idea of a marketing campaign. This allows us to offer highly-effective marketing campaigns as a service to our clients. It’s forced us to identify what areas of marketing campaigns are effective and which areas are not. We have to make sure that the client only pays for time and effort with an associated ROI. We’ve also created our campaigns to have a long-tail effect for the client, creating assets that generate revenue even once the campaign has reached its end. Most importantly, we’ve eliminated another area of ambiguity in communication with our clients, giving us the ability to consistently provide an exceptional experience. Jesse Williams is head of Mindbox's GROW division. He's a passionate marketer focused on growing enterprise software and technology companies through combining data and creativity to achieve market adoption.